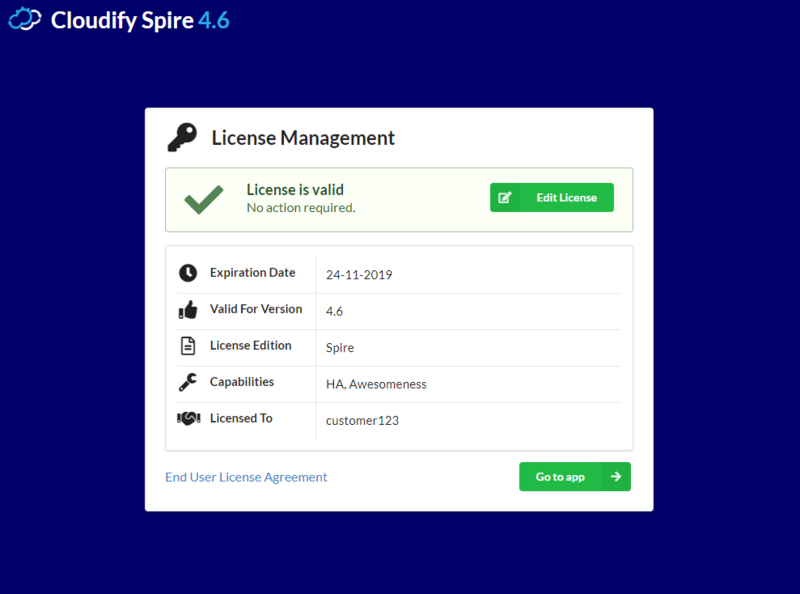 A new license mechanism was introduced as part of Cloudify 4.6. 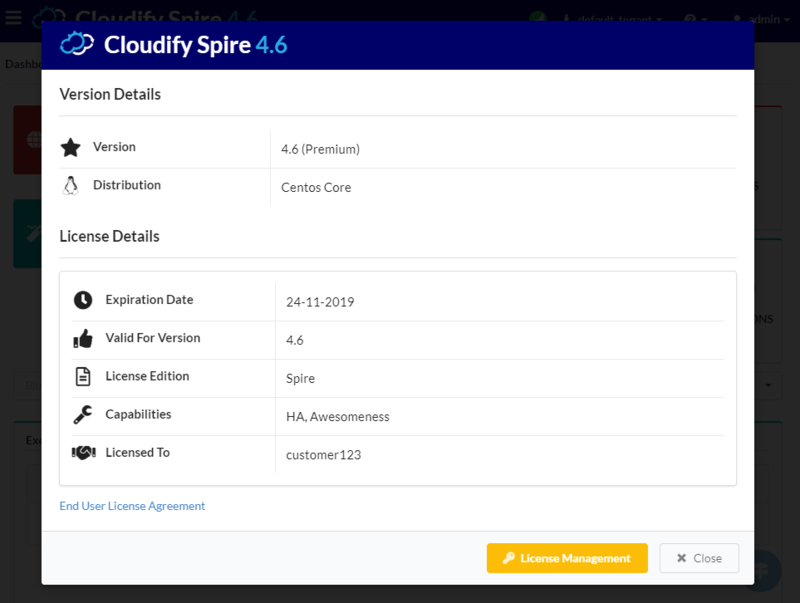 From 4.6 on, in order to activate a Cloudify Premium Manager, a valid license is required. 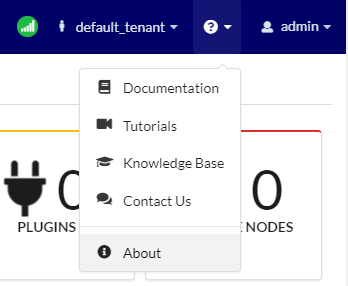 Before the Cloudify Manager is activated, most of the Cloudify REST APIs are blocked, and neither Cloudify CLI nor Cloudify Console is operational. Cloudify community version does not require a license, hence no activation is needed. If Cloudify is deployed as a cluster of managers, the license should only be applied once. This should be done through the active manager in that cluster. A Cloudify license is provided to all Cloudify Premium subscribed customers by Cloudify support. Cloudify Premium trial customers receive their trial license via email upon trial request. Request your free 60 day trial at https://cloudify.co/download/#trial. 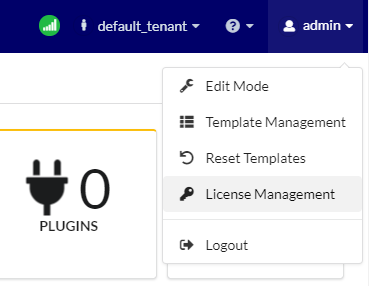 To activate your Cloudify manager submit your license through either the Cloudify management console (UI) or via the Cloudify CLI. Only admin users (users with sys_admin system role) are allowed to upload a license and activate the Manager. Go to app button will be disabled until you activate the product by uploading a valid license. Paste your licens into the text area. After the license was successfully uploaded you can see all it’s details on the screen, and Go to app button is enabled. Click Go to app button to go to the main application page. You can always check installed licenses details or upload a new license. Only users with sys_admin permissions have access to License Management option under the users menu. When the license expires, the Cloudify manager will display a notification specifying the new state. 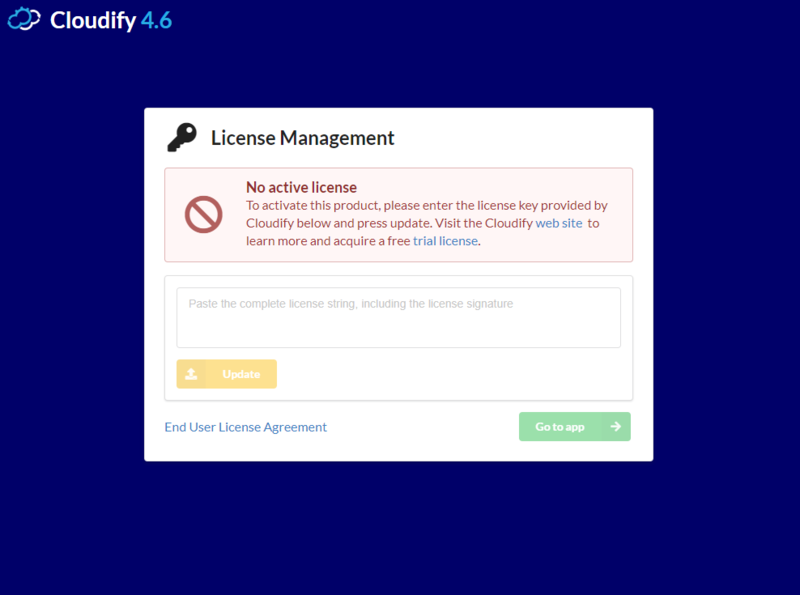 When using a trial license, upon license expiration, all Cloudify manager functionality will cease until it is updated with a valid license. This means that the REST API, Cloudify CLI and Cloudify Console will not be functional. 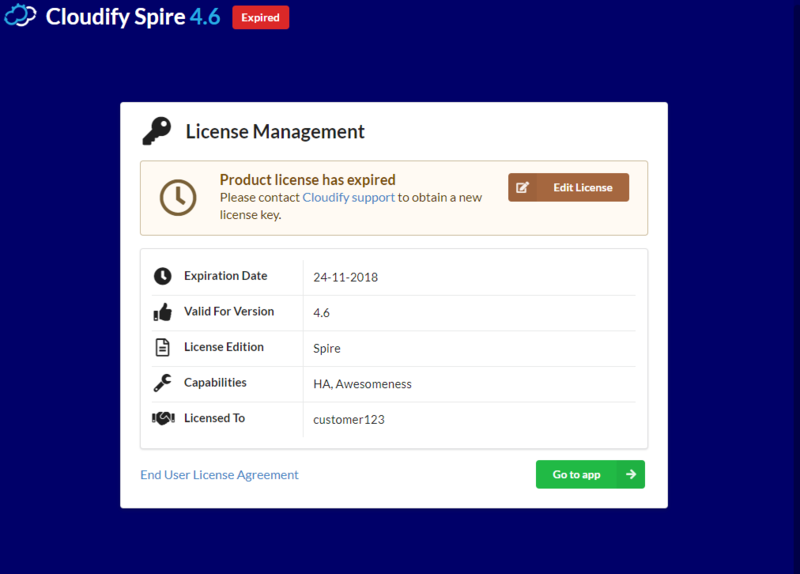 When the Cloudify subscription is renewed or updated with new capabilities a new license will be provided by Cloudify support. Updating the license can be applied through the CLI or the Cloudify Console. Only users with sys_admin permissions are allowed to update licenses. A single license may be active at any given time. Paste the license key into text area. The updated license details will be displayed in the License Management dialog.